These Black Forest Truffles are so good, you may never want to have plain chocolate truffles again! In this twist on classic truffles, chocolate is paired with tart dried cherries, to form a decadent, tart and tangy truffle. This recipe calls for kirschwasser, or cherry brandy, but if you prefer a more child-friendly treat, the alcohol can be eliminated. You can add a dash of vanilla extract, almond extract, or cherry flavoring as a substitute if you'd like. These candies, like most truffles, have several extensive chilling periods, so make sure you leave enough time when making them. Begin by making the chocolate-cherry ganache. First, place the chopped chocolate in a medium heat-safe bowl. Pour the cream in a small saucepan, and place it over medium heat. Heat the cream until small bubbles form along the sides of the pan, but don't allow it to come to a boil. Pour the hot cream over the chocolate and let it sit for 1 minute. Gently whisk the chocolate and cream until it is well-combined. Stir in the chopped cherries and the kirschwasser, if using. Press a layer of cling wrap on top of the chocolate, and allow it to come to room temperature. Place the truffle cream in the refrigerator to firm up for about 2 hours. Form the truffles. You can use a spoon to scoop 1-inch truffles onto a baking sheet lined with parchment. Alternately, you can fill a piping bag (fitting with a ½-inch round tip) and pipe 1-inch mounds on a prepared baking sheet. Pour the cocoa powder on a sheet of waxed paper or parchment. Dust your hand with cocoa, and roll the truffle mounds into balls. Return to the refrigerator until firm, about 1 hour. Melt the chocolate candy coating in the microwave, stirring after every 30 seconds to prevent overheating. Dip the formed truffles in the chocolate and return them to the baking sheet. 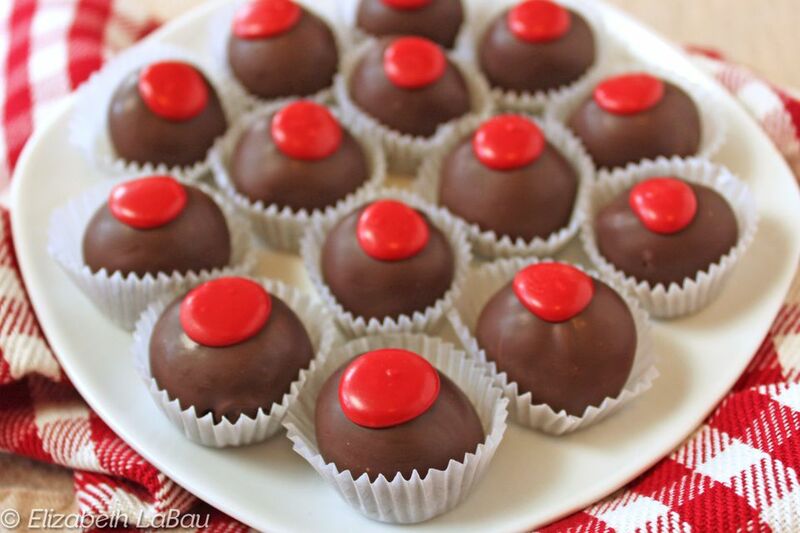 While the chocolate is still wet, top each truffle with red sprinkles or a sliver of dried cherry, if using. If you want to get the red-topped effect in the photo, melt some red candy coating and place it in a paper cone or plastic bag with the corner cut off. Pipe a dot of red coating on top of each truffle and let dry. Chill the truffles in the refrigerator until they are completely set, for about 15 minutes. For the best taste and texture, serve Black Forest Truffles at room temperature, and store them in an airtight container in the refrigerator for up to two weeks.